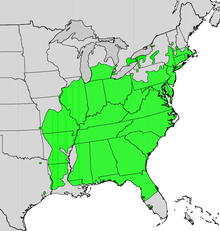 Bald cypress grows in swampy areas along the Atlantic coast from Delaware to southern Florida, west along the Gulf Coast to southeastern Texas and along the Mississippi river valley to southeastern Illinois. About one-half of the cypress lumber comes from the Southern States and one-fourth from the South Atlantic States. It is not as readily available as it was several decades ago. Bald cypress trees can reach heights of 150 feet, with diameters of 12 feet and an age of 2000 years. Most commonly, however, it grows to about 100 feet, 5 feet in diameter, and an age of 500 years. When grown in wet conditions, the tree produces "knees"; extensions of the roots which grow above the ground and the surface of the water and allow oxygen to reach the roots. General: The sapwood of bald cypress is narrow and nearly white. The color of the heartwood varies widely, ranging from light yellowish brown to dark brownish red, brown, or chocolate. The wood is moderately heavy, moderately strong, and moderately hard. The heartwood of old-growth timber is one of our most decay-resistant woods; but second-growth timber is only moderately decay resistant. Shrinkage is moderately small, but somewhat greater than that of the cedars and less than that of southern pine. Frequently the wood of certain bald cypress trees contains pockets or localized area that have been attacked by a fungus. Such wood is known as "pecky" cypress. The decay caused by this fungus is arrested when the wood is cut into lumber and dried. Pecky cypress, therefore, is durable and useful where water tightness is unnecessary, and appearance is not important or a novel effect is desired. Examples of such usage are as paneling in restaurants, stores, and other buildings. Working Properties: Bald cypress has moderate strength, hardness and pliability. Sharp tools are necessary to prevent raised grain. It nails and glues well and is high in paint holding ability. Durability: It is rated as resistant to very resistant to heartwood decay. Preservation: Moderately resistant to preservative treatment. Uses: Bald cypress has been used principally for building construction, especially where resistance to decay is required. It was used for beams, posts, and other members in docks, warehouses, factories, bridges, and heavy construction. It is well suited for siding and porch construction. It is also used for caskets, burial boxes, sash, doors, blinds, and general millwork, including interior trim and paneling. Other uses are in tanks, vats, ship and boat building, refrigerators, railroad-car construction, greenhouse construction, cooling towers, and stadium seats. It is also used for railroad crossties, poles, piles, shingles, cooperage, and fence posts.